Is the identity of this bird actually a mystery? Well, I know what it is. However, the Sybley Guide to Birds offered no guidance. And, Cornell’s Merlin Bird ID (an avian-recognition app) made a number of guesses, all of which were wrong. So, I thought that others might enjoy the challenge of identifying this large brownish bird. What is this late-summer bird? It’s a BBJ, for sure. Karen, I think he is making a play on the birding designation, LBJ (little brown job), by saying Big Brown Job — in short, no designation at all. Hmmm. Is it really brown or is it a trick of the lighting? It looks to me like a Raven. Judy, the brown is real. A raven with scant melanin? Susan, while this bird did not rate a mention in Sibley, this brownish bird is sufficiently common to have been illustrated on two birding websites. 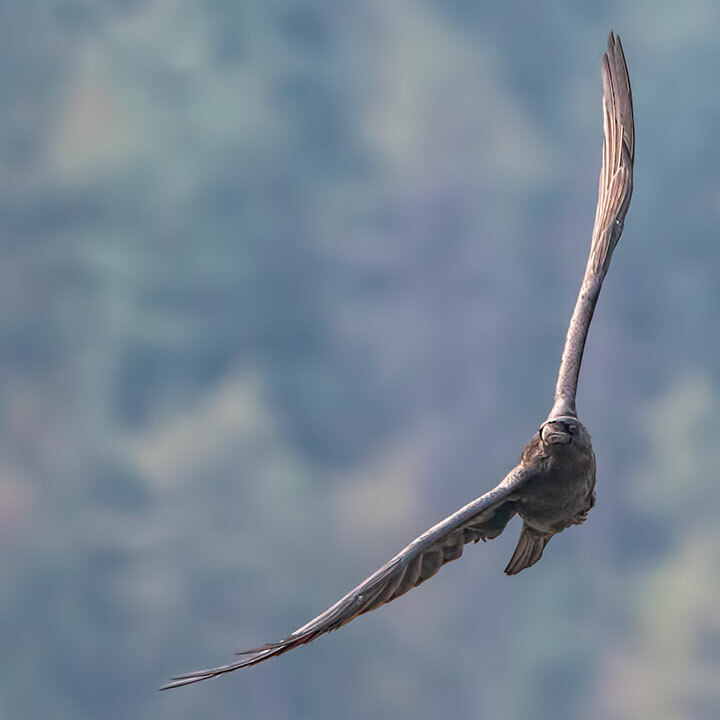 Is this a dark morph Swainson’s Hawk or dark morph Rough-legged Hawk? I’m using Stokes Field Guide. Immature (brown eyes) golden eagle. Ist year Bald Eagle—just fledged this summer. The mystery bird is a juvenile Common Raven. As such, Judy Brown and Susan Durant came closest by just observing that the bird looked like a raven that was somehow deficient in melanin. However, they did not know that this is a known feature of ravens. It seems that the juvenile raven is sometimes just rather brownish, something that Sibley fails to mention. The allaboutbirds.org site does mentions this and the National Geographic Magazine shows a really good picture of it. As to the raptor suggestions: By showing the view that I did — a raven’s bill that bends down and so looks rather like a hook in the foreshortened view — I knew this and, alas, was playing with you. So, no one said, “Oh come now, that is just a juvenile raven in its brown phase,” but two people came remarkably close to figuring it out. Congratulations to those two. You learn something everyday! Thanks for testing us!